Virginia Beach professionals longed for a private club to call their own for two decades. 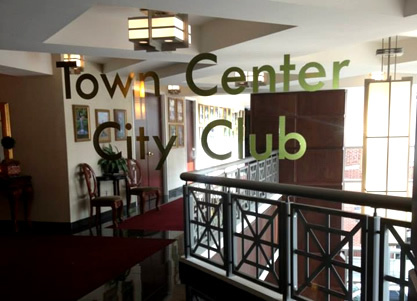 In 2004 businesswoman Barbara Lewis founded Town Center City Club. “A vibrant, trendsetting city like Virginia Beach needed its own private club, and that was my vision,” says Lewis, the club’s president. The club provides an exclusive, private dining and meeting facility where members can socialize, conduct business and entertain clients in an elegant, yet relaxed setting. City Club’s plush accommodations feature a traditional main dining room, luxurious club room bar, and two private dining rooms with state-of-the art amenities for meetings and private functions. The entire facility is presided over by an outstanding manager and excellent chef.